Casting Calls Las Vegas delivers casting calls and notices for auditions in the Las Vegas area. Actors can easily and efficiently submit directly to local TV, film, web, stage and other types of acting projects. Casting Calls Las Vegas's powerful, yet easy to use software, also allows those holding auditions and casting these projects a simple and expedited process for posting casting calls, reviewing submissions, searching talent and exporting submittals for easier casting outreach and management. Register and submit to local acting projects now! Easy and fast profile set-up, quick and secure project submission, verified producers. Post your casting calls to have quick and easy access to the best regional talent. Select, sort and export submissions for easy and efficient management and outreach. Receive casting call and audition notices for your clients, submit their profiles and coordinate with casting directors/producers, all in one place. 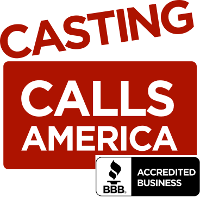 Part of the Casting Calls America software network, a bonded talent listing software provider accredited by the Better Business Bureau.